New York (November 12, 2018) – WorldStage was pleased to support SPARC’s annual LIVE ART concert in Richmond, Virginia with lighting and video packages for the fourth consecutive year. LIVE ART: Love played to a sold-out house at Richmond’s Altria Theater where Josh Groban, Jason Mraz, Michael McDonald and other recording stars joined LIVE ART students onstage for one of the city’s favorite events. The show was aired on public television for the first time in the spring of 2019. Founded in 1981, the non-profit SPARC (School of the Performing Arts in the Richmond Community) provides transformative performing arts education to more than 3,000 students, aged 3-18, every year. SPARC’s LIVE ART program integrates a performing arts curriculum with special education to create a unique and powerful program for students of all abilities. The program culminates in a mega-concert featuring celebrity recording artists who donate their time to perform with LIVE ART students in a night of music, dance, visual art and human connection. Thomas-Foley notes that the Altria Theater has a 70-foot proscenium stage and no equipment is available to LIVE ART for its concert. “We have to bring in everything: sets, lighting, crew. This is a very big performance. In order to light the theater the plot has to be extensive and large. WorldStage is our biggest sponsor. They help us plan and provide a lighting package and a projection package for visuals and work with us to assemble all of it. WorldStage supplied a large complement of moving lights for the show, including VARI*LITE 2500 and 3000 spots, Martin MAC Aura and 101 LED washes and Claypaky Mythos2. WorldStage also furnished Chroma-Q Color Force II LEDs, conventional Source 4 ellipsoidals and an MDG Atmosphere hazer. 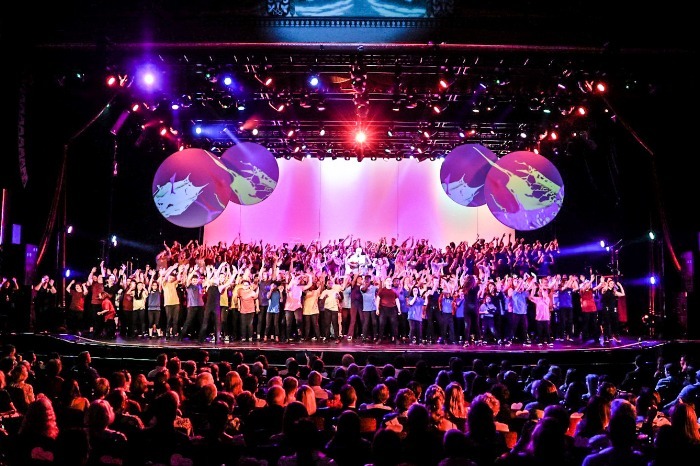 On the video side WorldStage provided an Epson 25K Pro laser projector and MacPro playback to display visuals throughout the concert that tell the students’ stories and provides some interactivity the performers onstage.